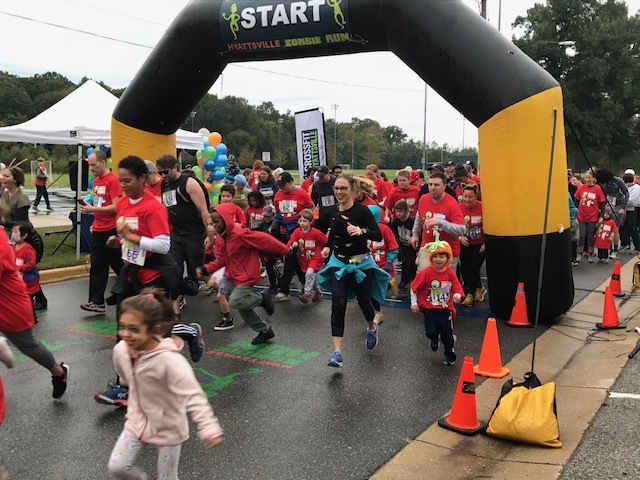 A year ago Richard Morris continued his support of the Hyattsville Elementary School PTA Zombie Run fundraiser as a Gold Sponsor; two weeks later he had a fall on October 26, followed by emergency surgery and complications. He died November 21, 2017. My memorial to him has been to keep his legacy visible, especially in the form of his books and songs. I am Barbara, his partner and wife of fifty years. This blog now functions as Blog B, whether B for Barbara or B as secondary to the two hundred wonderful posts Richard left to us in his original blog. 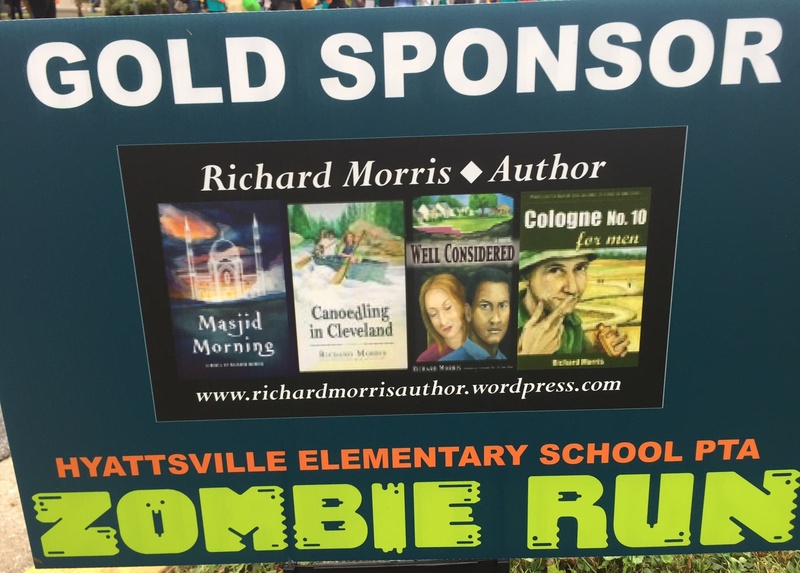 Today Richard Morris was a Gold-Sponsor-in-memory at the Hyattsville Elementary School PTA Zombie Run. 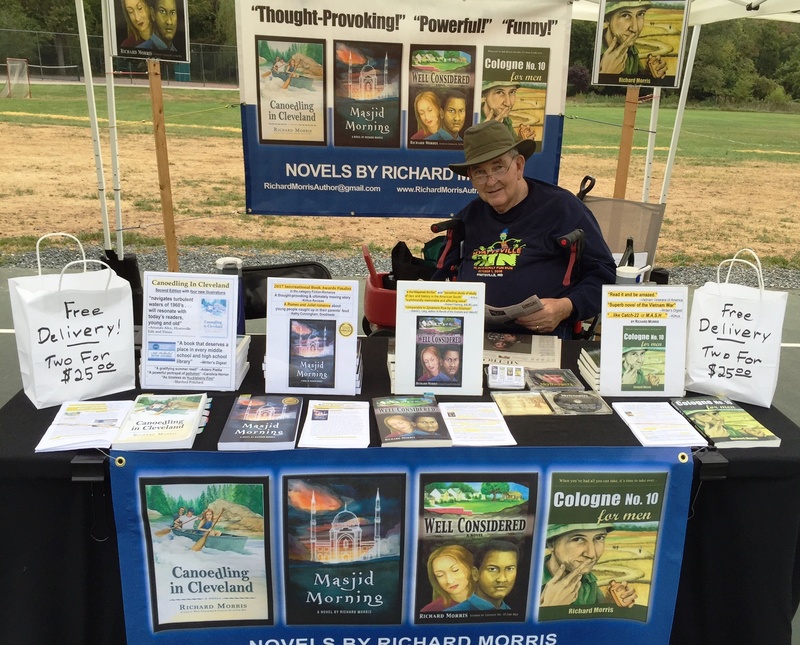 As a sponsor, there was a tent where I could display Richard’s novels and CD. 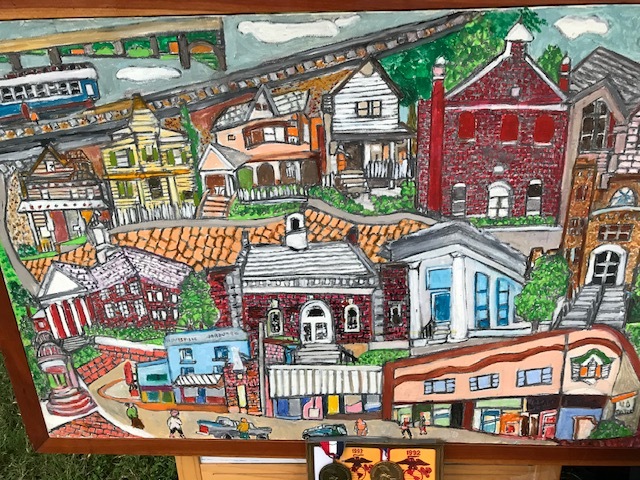 In addition, I took our Sy Mohr painting of Hyattsville to amuse the community in identifying locations. Although Sy died in 2016, Richard was his webmaster and had previously established and maintained Sy Mohr’s website: http://www.symohr.wordpress.com. 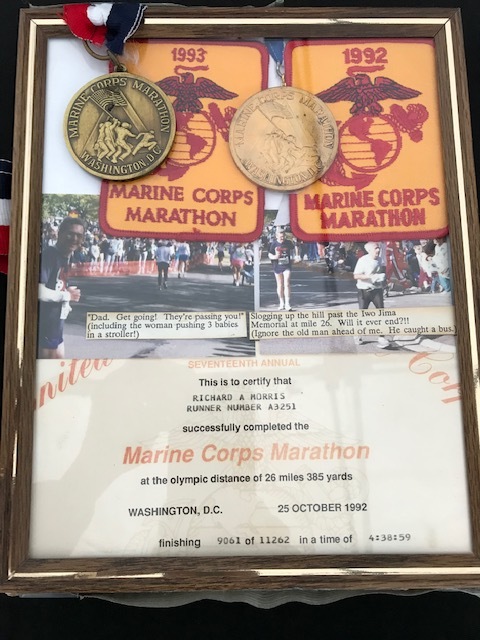 I also displayed Richard’s mementos from his two runs in the Marine Corps Marathon. Although we started out with light rain, that never keeps Hyattsville from supporting the Zombie Run. 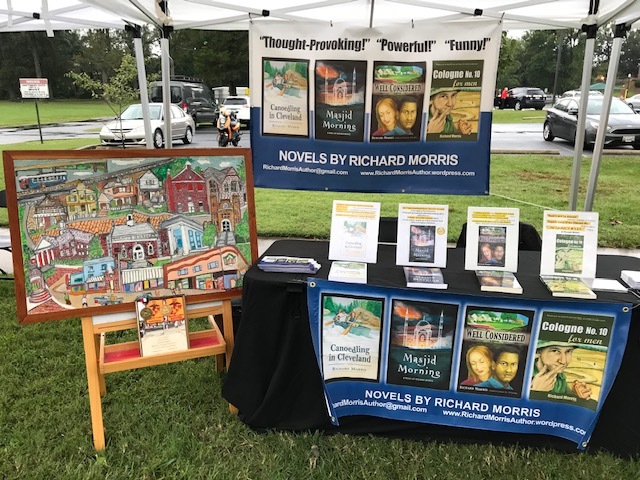 I was able to send home with hundreds of runners in their packet bags a card showing the beautiful poster display of Richard’s books (Cologne No. 10 for Men, Well Considered, Canoedling in Cleveland, and Masjid Morning) on the front and information about him on the back. This entry was posted in Relating to Canoedling in Cleveland, Relating to Cologne No. 10 for Men, Relating to Masjid Morning, Relating to Skytroopers, CD, Relating to Well Considered and tagged Hyattsville Elementary School PTA Zombie Run, legacy of Richard Morris, Marine Corps marathon, social justice novels, Sy Mohr artist, Sy Mohr Gallery. Bookmark the permalink. I will never forget all the fun times we shared.